Our beautiful Hawaii vacation rentals are located in Kailua, Oahu. We are across from Kailua Beach Park. You can relax by our pool and enjoy our tropical gardens, or walk less then two minutes and be at the most beautiful beach in the country. It is a great beach for children; the water is calm as there is a coral reef 1/2 mile off shore where the waves break. You can snorkel, swim, kayak, or just walk the beach for hours. You can also watch the sun rise in the morning over the ocean and the moon rise in the evening. It is truly breathtaking! 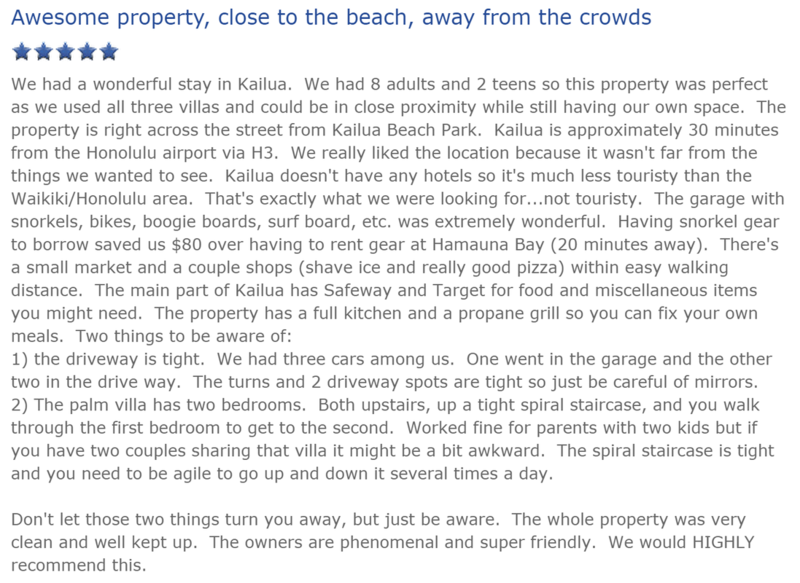 Kailua Town is located 5 minutes from the property and only 30 minutes from Waikiki. Kailua has wonderful restaurants, fabulous shops, coffee houses, gorgeous beaches and scenery, hiking, biking, kayaking, windsurfing, and kite surfing. Spend your Hawaiian Vacation in one of our beautifully appointed Oahu condo rentals, vacation rental homes, or villas. We are committed to providing you the best vacation accommodations. Family run for over 30 years. Our properties represent the best in their class. Our goal is to provide you with the very best vacation so you can relax and enjoy your time in paradise. Let us help make this Hawaiian vacation on the island of Oahu the most special one of all. The property is located just steps from Kailua Beach Park.